In the Kingdom of YHVH, everything has both a time, and season for everything under Heaven. King Solomon portrays this very issue. Ecc 3:1 For everything there is a season, and a time for every matter under heaven: 2 a time to be born, and a time to die; a time to plant, and a time to pluck up what is planted; 3 a time to kill, and a time to heal; a time to break down, and a time to build up; 4 a time to weep, and a time to laugh; a time to mourn, and a time to dance; 5 a time to cast away stones, and a time to gather stones together; a time to embrace, and a time to refrain from embracing; 6 a time to seek, and a time to lose; a time to keep, and a time to cast away; 7 a time to tear, and a time to sew; a time to keep silence, and a time to speak; 8 a time to love, and a time to hate; a time for war, and a time for peace. 9 What gain has the worker from his toil? What happens when a farmer plants out of season? What happens when the rains do not come in their seasons? What happens if the workers of the fields do not give the soil the correct nutrients in their times? The obvious answer to this question is the fields will not bare fruits, and if the worst happens, everything in the fields will wither and die. At the minimum, the crops would become weak and brittle, and produce very little fruit, and the fruit that is produced would be very undesirable. This is exactly what has happened to the body of Messiah. People are planting when they ought to be watering, watering when they ought to be tilling the soil, and tilling when they ought to be harvesting. How did this happen? Anytime there is a weakness or illness in the Body, the only answer can possibly be we have forsaken the instructions we were given to work as a unit. In today’s world, there are 38,000 Judeo-Christian denominations, and every one of them do things differently, and are on different time schedules we call Calendars. What this has caused is complete confusion. How can a Body move in one single unit if they are all on different schedules? Imagine trying to build a large structure with many moving parts with everyone doing things when they see fit, every man doing what is right in His own mind, it is utter chaos. YHVH has given us a very specific schedule to give very specific messages, and to conduct very specific actions, all in their Appointed Times and Seasons in order to maximize the yields of the Harvest, and to keep the crops and plants nourished and healthy in Lev. 23. The Appointed times have been reduced to a mere suggestion, and in some circles, entreated as if they are even evil. There are many reasons I was moved to construct this teaching, but one of the highest on my priorities is to show people the wisdom in doing things YHVH’s way, in His Appointed Times, and to silence the ignorance of arrogant ways of thinking. Who are we that we can give counsel to YHVH? Who are we that we can say that we can do things better than He, that we can build His House in a manner we see fit, instead of building it according to His patterns, in His times? For them that think there is no wisdom in what I am saying, please by all means, go draw specific plans to build a house, set deadlines in place, and see how you feel when the workers do absolutely nothing the way you instruct them to do it. What would you do? Would you not fire the workers? And probably have a few words to the project leaders on the way out the door! Something to ponder, we will get back to this later. Many times the Word of YHVH uses Physical things to give us very deep Spiritual Truths. In the last article “The Bread of Life” we saw how Yeshua uses bread as beautiful allegory to the Word, and how we have been given specific instructions on how to consume, ration, and deliver this “bread” on a daily and weekly schedule. This teaching will use Water as an allegory to describe the Seasonal consumption, rationing, and delivery of the Word, as well as how and when to discern the message we are to be delivering in a unified front, to accomplish the will of YHVH in the Earth. YHVH describes Israel as olive trees, wheat, barley, and grapes many times in the Word. These natural fruits of the land are used in producing oil, bread, and wine, the three key elements in the very Covenant we are established in with our Creator. These three elements are also the foods for the Spirit(Oil), Soul(Wine), and Body(Bread). Luk 4:18 The SPIRIT of the Lord is upon me, because he hath ANNOINTED(Oil) me to preach the gospel to the poor; he hath sent me to heal the brokenhearted, to preach deliverance to the captives, and recovering of sight to the blind, to set at liberty them that are bruised. Gen 27:25 And he said, Bring it near to me, and I will eat of my son’s venison, that my SOUL may bless thee. And he brought it near to him, and he did eat: and he brought him WINE, and he drank. Mat 26:27 And he took the cup, and gave thanks, and gave it to them, saying, Drink ye all of it; 28 For this is MY BLOOD of the new testament, which is shed for many for the remission of sins. 29 But I say unto you, I will not drink henceforth of this fruit of the vine(WINE), until that day when I drink it new with you in my Father’s kingdom. Isa 53:10 Yet it pleased the LORD to bruise him; he hath put him to grief: when thou shalt make his SOUL (blood) an offering for sin, he shall see his seed, he shall prolong his days, and the pleasure of the LORD shall prosper in his hand. So we see that the Oil, Bread, and Wine are the three elements of the Covenant, all food for the three parts of our Triune Nature, Body, Soul, and Spirit. We are made in the very Image of YHVH, so anyone having an issue with the Triune aspect of YHVH should consider this. So, what is the one thing all these have in common? There is one element we need to understand: the cycles of the harvest, in which the Olives/Oil, Grapes/Wine, and Bread/Wheat/Barley need to flourish and survive. It is true that a man must live and feed on Bread in order to survive. It is also true that man cannot live on Bread alone, but every Word that comes from the Mouth of YHVH. Just as there can be no bread without water to produce the wheat/barley needed to make the bread, in the Spiritual realm there can be no fruit produced without the Spirit. Water, Oil, and Wine are often used as allegories to the Spirit of YHVH, but there can be no wine or oil without water as well, so we must find out how to get the maximized amount of water we can in very dry places. This has been the very key to Israel’s long enduring lifespan as a people both in the physical and the Spiritual aspects of life. They were given water in the most unlikely places in the desert with Moses. After Yeshua ascended Israel received the Spirit and did the impossible in a time of great oppression and persecution. Water has always been the very substance that all life is sustained by. There is absolutely no life without water, and in the Spiritual sense, there is no life in the Word/Bread without the Spirit/Water. Even the Manna that came from Heaven was mingled with the dew(water) from Heaven. Exo 16:13 And it came to pass, that at even the quails came up, and covered the camp: and in the morning THE DEW lay round about the host. 14 And when THE DEW that lay was gone up, behold, upon the face of the wilderness there lay a small round thing, as small as the hoar frost on the ground. 15 And when the children of Israel saw it, they said one to another, It is manna: for they wist not what it was. And Moses said unto them, This is the bread which the LORD hath given you to eat. 16 This is the thing which the LORD hath commanded, Gather of it every man according to his eating, an omer for every man, according to the number of your persons; take ye every man for them which are in his tents. Now since we understand that everything has both a time and season, can we find a pattern of the times of watering or out pourings in order to maximize our intake of the Water of Life, the Spirit of the Living God? Absolutely, let us look into the words of the Torah, Prophets, Writings, Epistles, and Gospels in order to see the times, seasons, and the conditions we must meet in order to receive this Water of Life. Many teach that the covenants are “unconditional” but this is not a scriptural doctrine as we will see here. Lev 26:3 “>IF< you walk in my statutes and observe my commandments and do them, 4 then I will give you your RAINS in their SEASON, and the land shall yield its increase, and the trees of the field shall yield their fruit. There is a condition here, that we must walk in his statutes and commandments in order to receive the blessings of the Water that gives Life. Many will say that this is Old Covenant, and reject the idea because of a flawed understanding of a Grace Only doctrine, but in the New Covenant, in the New Testament, Yehsua/Jesus tells us the same words concerning receiving the Spirit. Joh 14:15 “>IF< you love me, keep my commandments. 16 I will ask the Father to give you another Helper, to be with you always. 17 He is the Spirit of truth, whom the world cannot receive, for it neither sees him nor recognizes him. But you recognize him, for he abides with you and will be in you. Even here there is an “IF” or condition attached to the promise, in the same context of the condition being based on keeping the commandments. This is not works based Salvation people, this is sanctification AFTER Salvation. So we see here that the conditions are tied to keeping the commandments. Many who do believe this will still not understand exactly how this works. Is there any way we can see that the receiving of the Water/Spirit solely depends on keeping the commandments? ABSOLUTELY, as with everything YHVH does, he does not change, and we have numerous patterns to look at and see not only is YHVH’s Promises True, but we can also know when the out pourings are to occur, and also know what the message we are to be Preaching during these out pourings, so that we may be in tune with what the High Priest in Heaven is trying to accomplish in the Earth, working as a unified body instead of 38,000 different voices saying “Thus says the Lord, when the Lord has not spoken”. We must look at the things we can see in order to understand the things we cannot see. Heb 11:1 Now faith is the substance of things hoped for, the EVIDENCE OF THINGS NOT SEEN. 2 For by it the elders obtained a good report. 3 Through faith we understand that the worlds were framed by the word of God, so that things which are seen were not made of things which do appear. In other words, we can understand the Spiritual by observing the Physical. Just as the wind blows, we cannot see where it is coming from or where it is going, but through the movement of the leaves and grass, we see that there is in fact wind, even though we cannot see it with our eyes. If the Spirit is equated with Water as it is many times in the scriptures, we should be able to peg down the timing of the out pourings. One thing YHVH does is instructs us very deep Spiritual Truths by teaching us through Physical things. He gave us very specific instructions on the Harvest Periods, as well as when these periods are. He tells us when to plow up, when to plant, when the rain comes, when to reap, and when to Harvest. All His harvest periods are surrounding the rains. There are two great rains in the year, the former rain and the latter rain. Hos 6:3 Then shall we know, if we follow on to know the LORD: his going forth is prepared as the morning; and he shall come unto us as the RAIN, as the LATTER AND FORMER RAIN UPON THE EARTH. The Former rain is in the fall, and the latter Rain is in the spring. In Lev. 23, YHVH gives us instructions on these Harvest times. In the spring, there is the Three Feasts of Passover, Unleavened Bread, and First-fruits. In the summer there is the Wheat Harvest of Shavuot/Pentecost. In the fall there is the Feast of Trumpets, Day of Atonement, and Feast of Tabernacles. The Three main Harvests are First Fruits in the spring, Shavuot/Pentecost in the summer, and Feast of Tabernacles/Succoth in the fall. The rains water the Earth in their appointed times and seasons, unless of course YHVH has decreed a drought. Now, we learned in the Bread of Life teaching the daily times we should take in the Word, but in this we will see the Times and Seasons we are to intake the Spirit, and the Word we are to project. What do I mean when I say project? The way Rico Cortes teaches is that our relationship is a vertical/horizontal one with the Creator. We receive instruction by intaking it coming from on High, vertical. Then, we are to project it as light to the Nations, horizontal. We are commanded to observe these Harvest periods at very specific times and seasons. To begin, let us cover the Spring Harvest, and see how we can understand the timing of the out pourings and the Word YHVH is sending into the Earth. We must understand the times of the rains in order to understand the way it is directly related to the Harvest periods. There is no life or growth without water. The Feast of First Fruits is the fruit not of the spring rains, but of the winter rains. The water in the winter time is the water that feeds the Spring Harvest, and the water in the spring is what feeds the Summer Harvest. Water comes first, then growth and fruit. At this moment we are experiencing the Winter rains(Jan. 24th, 2013) that is feeding the Harvest of the First Fruits of Barley for the Spring harvest. If we do not prepare the fields for the rains, the fruit will not yield. The rains will come no matter what conditions the soil is in, so we must make sure we are doing the correct preparations for the Fields to be ready for the Rains. What we will do now, is identify the key elements in the Spring Harvest. Remember, the Barley and Wheat are used to make Bread, and the Olives and Grapes are used to make the oil and wine, and if we work the vineyards according to the instructions and times YHVH gives us, we should as in the physical, yield a healthy and fruitful harvest of spiritual yields. No matter whether grapes, olives, barley, or wheat, all these are representing those in Covenant with YHVH, the Children of Israel. Mat 13:37 He answered, “The person who sowed good seed is the Son of Man, 38 while the field is the world. The good seed are those who belong to the kingdom, while the weeds are those who belong to the evil one. Isa 17:4 And in that day the glory of Jacob will be brought low, and the fat of his flesh will grow lean. 5 And it shall be as when the reaper gathers standing grain and his arm harvests the ears, and as when one gleans the ears of GRAIN(Barley, Wheat) in the Valley of Rephaim. Isa 17:6 Gleanings will be left in it, as when an OLIVE TREE is beaten– two or three berries in the top of the highest bough, four or five on the branches of a FRUIT TREE, declares the LORD God of Israel. Deu 32:2 My doctrine shall drop as the RAIN, my SPEECH shall distil as the DEW, as the small RAIN upon the tender herb, and as the SHOWERS upon the grass: 3 Because I will publish the name of the LORD: ascribe ye greatness unto our God. 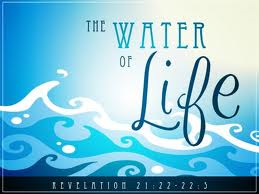 So, in the Bread of life teaching, we see that the bread represents the Word, and here in these verses, we see that also water represents the Word, delivered through the Spirit. We could use the allegory that the bread is the letter of the Torah, and the Water is the Spirit of the Torah. You cannot have one without the other, but the water comes before the bread, to give the seed of grain life. In other words, without the Spirit, the letter has no substance. We can know the Word, and Preach the Word, but if there is no Spirit involved, it may as well be dead, because it will not yield fruit without the Water/Spirit. So, what we must do is figure out when we need to plow, plant, and reap the fields in order for the best yields according to their Appointed Seasons and times. Remember, the water comes first, so we must know that plowing and sowing should be done in between the last Harvest, and the next rain. Now we must identify how we can apply plowing and planting as a Spiritual matter. We already know what the field is, the field is the World, but on a smaller scale, it is the immediate areas one is located in. Also on a smaller scale, the field on an individual bases would be one’s heart. The seed, the Word, must be sown in one’s Heart. We see here that the word must be sown in one’s heart, so on an individual bases, the fields are the hearts of men. We find many times throughout the scriptures that the Word must be in one’s heart, because what one has on His Heart will be what he projects into the World, as stated earlier, it is a vertical/horizontal relationship. Let us look at a few of the places of the Word being sown into the Heart. Deu 30:14 But the word is very near you. It is in your mouth and IN YOUR HEART, so that you can do it. Heb 8:10 For this is the covenant that I will make with the house of Israel after those days, declares the Lord: I will put MY LAWS(the word) into their minds, and write them on THEIR HEARTS, and I will be their God, and they shall be my people. Eze 36:26 A new HEART also will I give you, and a NEW SPIRIT(water)will I put within you: and I will take away the stony heart out of your flesh, and I will give you an heart of flesh. 27 And I will put my spirit within you, and cause you to walk in my statutes, and ye shall keep my judgments, and do them. So, the point is we must sow the seed, the Word, into the hearts of men. Now, in the parables, we see that there are different types of fields, or soil, that we will encounter. Some of the seed falls on unplowed land, and the dirt is hard, so the seed sown does not grow and produce fruits. We also see that some is sown among thorns, and gets choked out by the cares of the world, and then we see the seed sown in good soil, plowed, soft, and fertile soil. The problem we have in this world is most of the soil/hearts are hard, and are not yet softened to receive the Word/seed with gladness. This is where the plowman comes in. Many Gifts of the Spirit are given men, in order that they may be equipped for the task that our Master, the owner of the fields, gives us so that we may bear fruit for His Kingdom. The Spiritually gifted man who should be plowing would be the Prophet. These men will be a bit harder and more Zealous than the other Giftings. These men need to be this way, because a hardened heart cannot be broken or softened with a soft tool. The plow blades must be hard and sharp in order to cut through the hardened soil/heart of men. The Prophet will show less mercy than say an Evangelist. We see this in the book of Ezekiel. Eze 3:4 And he said unto me, Son of man, go, get thee unto the house of Israel, and speak with my words unto them. 5 For thou art not sent to a people of a strange speech and of an hard language, but to the house of Israel; 6 Not to many people of a strange speech and of an hard language, whose words thou canst not understand. Surely, had I sent thee to them, they would have hearkened unto thee. 7 But the house of Israel will not hearken unto thee; for they will not hearken unto me: for all the house of Israel are impudent and HARDHEARTED. 8 Behold, I have made thy face strong against their faces, and thy forehead strong against their foreheads. 9 As an adamant HARDER THAN FLINT have I made thy forehead: fear them not, neither be dismayed at their looks, though they be a rebellious house. We can see in the calling of Jeremiah that he was to be one who tears down, breaks up, and supplants. So, the plowman needs to be the hardened Prophetically gifted man. His job is to tear down all falsities, by using the Word as a sharpened and hardened adamant, to break up the hardened soil/heart of a man. The Prophet should always precede the one who sows, the Evangelist, more on the Evangelist in a bit. The Prophet is not one really showing much mercy, but the Prophet speaks of judgment. He is the one who will tear down the false doctrines as Elijah, when he went up against the False Prophets of Baal, or the one sent before the sower, the Son of Man, to tear down the falsehoods men have created through the deceptive theologies and doctrines that are not of YHVH. The Prophet will only be interested on two words, “I REPENT!” The Prophet has many tools to get one to say these words, and to bring a man into humbleness. He can make predictions of coming judgment, he can show signs and wonders, but the primary role is not making predictions of coming judgment, nor of showing signs and wonders, but of calling men back to the instructions of His Master, the Torah/Law of YHVH. This is all that is on a Prophet’s mind, to show men that they are sinners and are in need of repentance. The Plowman/Prophet will use all the tools given Him in order to break up the hardened soil/hearts of men. When the time for plowing comes, the Prophet is the man in your assembly you want to send into the fields first, especially if it is new ground. We see this in the fact that John the Baptist came ahead of the sower, the Son of Man, the Messiah of Israel, Yeshua/Jesus. Mat 3:1 In those days John the Baptist came preaching in the wilderness of Judea, 2 “REPENT, for the kingdom of heaven is at hand.” 3 For this is he who was spoken of by the prophet Isaiah when he said, “The voice of one crying in the wilderness: PREPARE THE WAY OF THE LORD(sower); make his paths straight. (plowing and tilling)'” 4 Now John wore a garment of camel’s hair and a leather belt around his waist(heardened and rough), and his food was locusts and wild honey. 5 Then Jerusalem and all Judea and all the region about the Jordan were going out to him, 6 and they were baptized by him in the river Jordan, CONFESSING THEIR SINS. Now, the timing of sending out the Plower/Prophet is a key essential element. What good does it do us to till up soil as the rain is falling? The seed/Word has not yet been planted, so we labor in vain if we plow out of season. As stated earlier, there are three Harvests, the spring First fruits Barley Harvest, the summer Wheat Harvest of Shavout/Pentecost, and the fall fruit harvest during the Feast of Tabernacles. We want to send out the Plowman/Prophet just after the reapings of these Harvests are finished. We will base our model from the Lev. 23 Feasts. The Winter rains come after the fruits Harvests of the Feast of Tabernacles, so we want to send the Plowman/Prophet out as soon as the Harvest of Tabernacles is over. We need Him to plow up the hardened soil/hearts so that the sower, the Evangelist, can plant new seed/Word in the fields/hearts. The Winter rains will water the seed planted during this time, so the plowman must plow, then the Evangelist must sow the seed after the plowman has finished plowing. In an easy to understand way of explanation, once a man has acknowledged he is a sinner, and chooses to repent, we know that the field/heart is plowed. The next step is sending the Evangelist/Sower. The Evangelist will be a man of compassion, mercy, and Faith. He will be more patient and sympathetic than the Plowman/Prophet. He usually does not have the discernment of the Plowman/Prophet, but where he is weak in this area, he is extremely strong in the area of mercy and compassion, he wants the repentant sinner to be redeemed. The Evangelist should deliver the milk of the Word, the simple Salvation message. His job is to bring unbelievers into the knowledge of the Messiah, and providing a message of hope, and atonement for the sins that these people have repented from by the testimony of the Plowman/Prophet. The Evangelist is concerned primarily with getting people to accept the Messiah so their sins may be blotted out in His shed blood. The Evangelist/Sower will plant the Seed/Word where the Plowman/Prophet has plowed and tilled. One thing that is very important, once the Field has been plowed, and the seed has been sown, the Plowman/Prophet must remove Himself from the field, there is no reason to plow what has already been plowed and planted, this could damage the fields and the yields will not be as good. We see this also in John the Baptist. A Prophet who continues to plow after the fields have been plowed, tilled, and sown, will only damage the fields. He does not have the gift of mercy as much as the Evangelist. This is why a Prophetically gifted person should never run an Assembly, he must be a Servant of the Shepherd, and assist in ensuring the enemy does not sow bad seed in the field. In other words, the Prophet must make sure that the enemy does not deceive the less discerning and more compassionate people into accepting a watered down message or teaching. He is to assist the Shepherd in making sure sound doctrine is being taught and assist in correcting error if needed. Once the rains come, the seed will start to flourish and grow. When the rains comes, that should be the time when the Teachers/Shepherds/Pastors should be teaching the Word in a more in depth application, weaning the new converts from milk and slowly moving them on to stronger meat. This would be equivalent to providing pruning and cultivating the fields, trimming off the access that may choke out the plant. The Prophetically gifted person will assist the Shepherd/Pastor in teaching, again ensuring sound doctrine is being taught. The Prophet should not interact directly with the people as much as possible, but use His skills during the time of nurturing to assist in teaching to the Shepherd/Pastor. The Shepherd/Pastor will be gifted in counsel, teaching, and will have a descent balance of mercy and judgment. He is the one who protects the flocks and leads them in the direction they should be going. The overall Message of the first Harvest, during the season of Unleavened Bread, the message we get in our Torah Portions and in the rites of the Feasts during this time of year are focused on entering Covenant. This is when the Messiah offered the Covenant to the Bride, the Cup of Passover, the Wine, representing the Blood of the Covenant. The Harvest that is yielded during this time of year is from the seed that was planted after the last Harvest. Again, the main and primary message we get during this time is the message of entering covenant, but for them that are already in covenant, we see a message of cleaning the leaven/sin from our hearts. Remember, every time there is a harvest, there is both good and bad fruit, and we must at the times of harvest separate the good fruit from the bad. This is seen in the Parable of the wheat and the tares. We must not uproot the tares outside of Harvest times, lest they take some of the wheat with them. In other words, we do not want to throw the baby out with the bath water. What we see in the Harvest time of the Messiah that a tare in Judas had been sown among them by the enemy. Yeshua did not call Judas out and let the tare show himself and his own colors. The way we will know a tare from the wheat is when wheat is ripe, it bows, as in humility, at the time of the Harvest, but a tare will stand erect and upright, showing his Pride and rebellious ways to all around them. Am I saying we do not correct sin? ABSOLUTELY NOT! But as stated, if a tare is truly a tare, when we go through the culling process as prescribed in Matthew 18, a tare will show Himself as rebellious and prideful, because he is given three opportunities to repent, first by one face to face, then by two or three witnesses, then at the time of Harvest, he shall be shown to the entire congregation and will be culled as a heathen if he refuses to repent(bow) and will remain erect. This is how we know he is a tare, we should not cull the tare before the Harvest times, because in doing so, you could uproot or damage the root of the wheat in the process. For them who are conducting Bet Dins(Courts of Judgment), remember this, it is easier to spot a tare at the time of Harvest than it is when the wheat/barley is not yet ripe. I try my hardest if I think I have a tare, to start the Matthew 18 Process in the times prescribes as harvest periods, usually forty days before the Harvest I start my inspections, so that ample time for someone to repent is given, we do not want to force anyone into repentance based on motives of fear, we want them to repent because they are convicted and convinced of sin. A tare at the time of harvest will stand erect and proud when the wheat is bowing over in humility. This takes patience on the part of the Plowman/Prophet and the Shepherd/Pastor. If we uproot a tare out of the times of Harvest, some of the wheat may go with them, remember this, we want to get the wolf, and not the sheep, the tare, and not the wheat. As soon as the week of Unleavened Bread is finished, the Plowman/Prophet should start again in a new field, and also assist in the already established fields. We see that between the week of Unleavened Bread and Shavuot/Pentecost, that the Apostles had emotions and thoughts of doubt and lost hope. We should all anticipate this to be the case year to year also with new converts, even seasoned vets at times. Keep this in mind. This is the time that the Shepherds and Sowers/Evangelists should be using that Gift of mercy, compassion, and encouragement, and the Prophet should be fending off any parasites that may be trying to get into the crops. Again, the process of plowing, sowing, and nurturing in that order must be started over again once the last Harvest is finished. The Primary message we get during Shavuot/Pentecost is confirming the covenant, the sealing and consummation of the covenant, when the Holy Spirit and the Torah were given, to set us apart and seal us as a people sanctified to YHVH. We should be focusing our message to fit this agenda YHVH has long ago established. It is also a season of Harvest, and at Shavuot/Pentecost, we again see the tares exposing their selves by refusing to bow in humility, and again, we see them being cut off and tossed away to be burned. The Torah was given at Shavuot, and there were them that had committed idolatry and were called to repentance. Some bowed in humility, others stood in pride, and the tares were culled from the field. Exo 32:25 And when Moses saw that the people were naked; (for Aaron had made them naked unto their shame among their enemies:) 26 Then Moses stood in the gate of the camp, and said, Who is on the LORD’S side? let him come unto me. And all the sons of Levi gathered themselves together unto him. 27 And he said unto them, Thus saith the LORD God of Israel, Put every man his sword by his side, and go in and out from gate to gate throughout the camp, and slay every man his brother, and every man his companion, and every man his neighbour. 28 And the children of Levi did according to the word of Moses: and there fell of the people that day about three thousand men. In an opposite of this, at the second fulfillment of Shavuot/Pentecost, we see there was 3000 men added to YHVH, a good yield, but we also can see the tares standing in pride as well. Mat 5:21 Ye have heard that it was said by them of old time, Thou shalt not kill; and whosoever shall kill shall be in danger of the judgment: 22 But I say unto you, That whosoever is angry with his brother without a cause shall be in danger of the judgment: and whosoever shall say to his brother, Raca, shall be in danger of the council: but whosoever shall say, Thou fool, shall be in danger of hell fire. 23 Therefore if thou bring thy gift to the altar, and there rememberest that thy brother hath ought against thee; 24 Leave there thy gift before the altar, and go thy way; first be reconciled to thy brother, and then come and offer thy gift. 25 Agree with thine adversary quickly, whiles thou art in the way with him; lest at any time the adversary deliver thee to the judge, and the judge deliver thee to the officer, and thou be cast into prison. 26 Verily I say unto thee, Thou shalt by no means come out thence, till thou hast paid the uttermost farthing. Am I saying we must wiat till these 40 days to reconcile with our Brothers? ABSOLUTELY NOT! What I am saying is this is the primary message and the primary things we should be focused on leading into Yom Kippur/Day of Atonement. The first of the month of Elul, or the Sixth Month, starts this 40 days that is known throughout the Hebrew Culture as the 40 days of Teshuva/Repentance. After 30 days from the first of the Sixth Month, we find the observance of the Feast of Trumpet/Yom Teruah. For 30 days from the New Moon at the Rosh Chodesh(New Moon) of Elul(6th Month) we find this observance. This day is a blowing of Trumpets, warnings of judgment to come, that will begin in the House of YHVH after the Day of Atonement/Yom Kippur. The focus of the message in this time is warning of judgment, and also one of New Revelation. It is a time of revealing, maybe of new prophetic insights, or of undetected sin in our lives. The ten days in between the Feast of Trumpets/Yom Teruah and the Day of Atonement/Yom Kippur is known as the Ten Days of Awe. These ten days is the last ten days to reconcile with a Brother and with YHVH before the Books in Heaven are opened on the Day of Atonement/Yom Kippur, the time that the courts of judgment sit and convene every year in the Heavenly Courts. Once the Atonement is made for the humbled, then the judgment begins of the wicked. Five days after this Day of Atonement for the Israelite Nation, dispersed or in the Land, we find the Feast of Tabernacles. This is the Fruit Harvest, the Harvest of the fall fruits of the olives, the figs, pomegranates, and other fruits. This is also the time that the Nations have a bull offered for their sins, and this is the reason that the Nations in the Millennium will be required to observe the Feast of Tabernacles. We find this in the Book of Zechariah. Zec 14:16 And it shall come to pass, that every one that is left of all the nations which came against Jerusalem shall even go up from year to year to worship the King, the LORD of hosts, and to keep the feast of tabernacles. 17 And it shall be, that whoso will not come up of all the families of the earth unto Jerusalem to worship the King, the LORD of hosts, even upon them shall be no rain. 18 And if the family of Egypt go not up, and come not, that have no rain; there shall be the plague, wherewith the LORD will smite the heathen that come not up to keep the feast of tabernacles. 19 This shall be the punishment of Egypt, and the punishment of all nations that come not up to keep the feast of tabernacles. 2Ti 4:1 I charge you in the presence of God and of Christ Jesus, who is to judge the living and the dead, and by his appearing and his kingdom: 2 preach the word; be ready in season and out of season; reprove, rebuke, and exhort, with complete patience and teaching. Surely, a man can come into repentance at any given time under the right circumstances, and YHVH can bring a man in whenever he wishes, but this teaching is dedicated to showing those who already have functioning Ministries what they should be doing as a team effort to echo the Word we receive from the Heavenly High Priest in their appointed times so that we may have a great yield in our fields and a great Harvest for our Master when he returns. The Torah Portions are set up on this same exact outline, so it is already made easy for us to follow the right instructions in the correct times so that we may optimize our delivery in one accord to all Nations, and present a great yield for our Master year to year. I pray that you now may understand some of the finer points to the Water of Life and now go out and tell them all who thirst, come drink freely of the Water that Gives life. May YHVH bless you in everything you do in His fields, may he greatly increase the Harvests, and may he present and raise up workers for his vineyards, for the fields are many and the laborers are few, HaShem Yeshua, Amein Amein!